Product prices and availability are accurate as of 2019-04-23 15:55:57 CDT and are subject to change. Any price and availability information displayed on http://www.amazon.ca/ at the time of purchase will apply to the purchase of this product. The visual design won't be to everyone's tastes, but the build is strong, and it's constructed in a way that won't have you fearing for its safety. 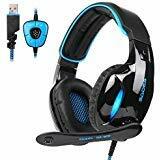 The gaming headset compatible with Xbox one, PS4, mobile,PC,computer,laptop and other device that features with a 3.5mm jack connector. Extra Microsoft adapter (Not Included) is needed when connect with old version Xbox One controller. Full range of 40MM speaker and professional game stereo driver IC bring you a immersive game sound experience. Headset integrated onmi-directional microphone to deliver clarity and true noise cancellation. It can't cancel the noise completely but it won't damage the sound. Delivering superior audio quality, let you completely immersed in the game. Superior comfortable wearing with synthetic leather-wrapper ear-cushions allow you to play for hours. Adjustable headband is suitable for all gamers. Robust design, high strength headhand, adjustable mic and durable braided wire with one key mute switch and sound controls optimized for professional gaming.